Nothing cleans your pastures and horse property like Super Scooper! Is Manure Ruining The Beauty, and Health, of YOUR Horse Property? Look in any pasture and you can see it, ugly mounds of manure- often accompanied by flies... sometimes spilling over onto your roads and common grounds. When Manure happens- Super Scooper is the answer! Unsightly Manure Piles Can Even Cost You Business! Yes, it's true. If you are a training or boarding stable, seeing manure piled up everywhere sickens and worries clients. NO ONE wants their horses standing in poop... especially when the stable down the road is nice and clean. Super Scooper can not only keep your property clean, but it can increase the value and appeal to potential clients-- and it is a business write off! 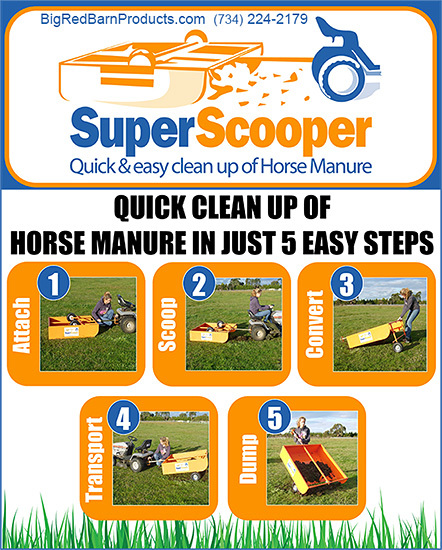 Super Scooper Offers Quick & Easy Clean up of Horse Manure ! Cleaning up horse manure becomes a breeze with the innovative and easy design of the Super Scooper. With the ability to change from a scooper to a trailer to transport manure in seconds, there is no quicker or more efficient Horse Manure Removal System available. Attach the Super Scooper unit to a tow vehicle such as garden tractor, ATV, small tractor or even golf cart then drag it along behind to scoop up manure. Once picked up, the Super Scooper is easily converted into a small trailer in less than 20 seconds to transport and dump the manure at a site of choice. How Can The Super Scooper Save Me Money? Horse care, feed bills, fertilizer, pesticides, disposal fees, civic fines and EPA fines. Manure removal from pastures and paddocks creates a healthier environment for your horses. Less worms and less disease means less large animal vet bills and less medications to purchase. Manure removal allows better grass growth and more foraging for your stock - decreasing supplemental feed costs. Harvested manure, properly composted makes good fertilizer. Friends and neighbors can use it in their gardens and orchards. Trees love it. By composting the manure you will save on disposal fees to have it trucked out. Less manure means less flies which means less pesticides. Many towns, villages and townships along with cities are starting to issue tickets for manure that is considered a nuisance. Many states and the EPA are starting to legislate manure proximity to water sources and are now issuing fines for violation. Manure best practices all call for collection of manure. The Super Scooper is a manure collector that can save you time and money. Having the pleasure of owning horses comes with the task of horse manure management. Horse manure management greatly impacts the health and safety of our animals. Parasites and disease can incubate within these piles. Spreading fresh manure is also a risky proposition as it can lead to illness, reduced plant growth and increased weed population. Horse manure collection is the start of a system that can provide better habitat for your horses and generate a good fertilizer to boot. Almost all other collection devices require backbreaking work or use of another motor to create suction. The Super Scooper is a passive device using no fuel other than in your tow vehicle. No motors to fuel and ease of operation. Is It True That Super Scooper Only Costs About $1300? Yes and it is SO worth it for a CLEAN horse property for years to come! The search for a reasonably priced manure collector is what lead to the Super Scooper coming to the US. $50 for a shovel and a bucket and hours in the fields was the first option. The next step was a $5000 vacuum with a hose that you had to hold as you drove it around. The Super Scooper was a proven product, with a great sales history, and good performance on most surfaces. Is The Super Scooper Durable So I Can Enjoy It For Years To Come? Yes! The product is galvanized and powder coated to provide many years of service. At $1300 it is a great tool for the residential horse owner, Horse Rescues and for the cleaning of paddocks quickly. Is There An Easy Payment Plan Available or Discount Available? Yes! Discounts are offered for FFA students and Rescues. Big Red Barn Products wishes to support education programs in the equine field. We offer a 10% discount to anyone currently in a FFA program or other student program. Please contact us for this discount. We will offer the same discount to public and private schools with equine programs. A payment plan is available through PayPal. Call and Order Your Super Scooper TODAY! Don't let your beautiful horse property and pastures get ruined, and become parasite breeding grounds! Super Scooper is easy to use, and turns your Pooperty into a respectable PROPERTY that you will be proud to have your clients, visitors or own horses enjoying. Call Dave today and let him tell you how the Super Scooper will change your life!